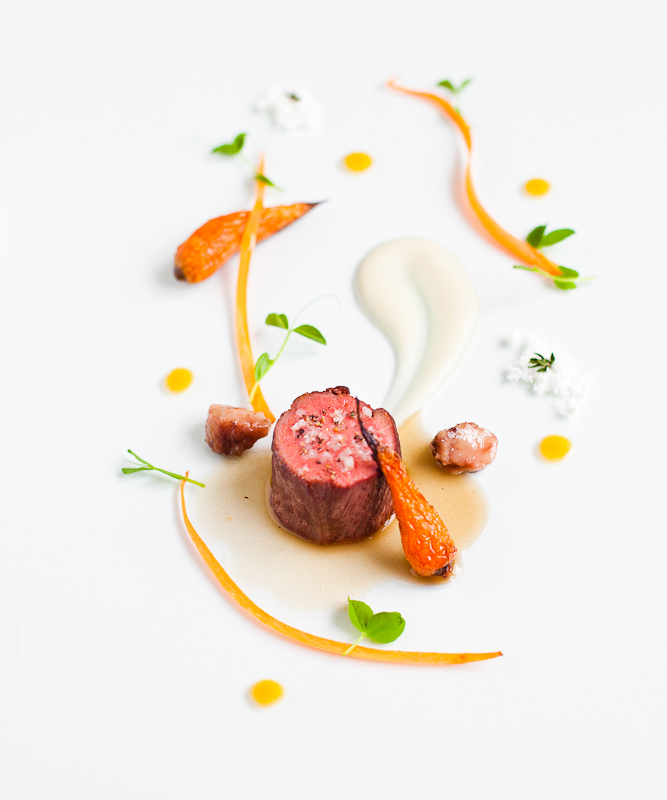 Inspired by Eleven Madison Park - Beef Tenderloin, Carrots, Peas and Potato — Eat a Duck I Must! Don't forget, Valentines Day is right around the corner and if you are adventurous enough to try it, the recipe can be found below. I am sure your partner will thank you for not serving a frozen meal that day. Although, maybe I WILL defrost a family pack of salisbury steak for Jared...! Très romantique! Place the beef tenderloin with a sprig of thyme, minced garlic and a tablespoon of olive oil into a vacuum sealed bag. If you are like me and don't have have a vacuum seal, take the ingredients and roll it up tightly with plastic wrap. Wrap several layers to prevent water from seeping in. Sous vide the beef at 130F for 45min to 1 hr in a thermal circulator or bring a large pot of water to 130F. It is easier to control the temperature of the water in a large pot of water since thermal retention is higher. Once the beef is up to temperature, remove it from the wrap. The beef should retain the cylindrical shape. Heat a pan until it is smoking hot, add a few tablespoons of oil and quickly sear the beef on all sides to create a nice brown crust. If your pan is not hot, then it will take longer to get it brown, in which case, your meat will go from a perfect medium to medium well. Note: You can use a larger piece of tenderloin in the dish if you are making this as the main entree. The portion size was designed around a tasting menu with multiple courses. Roast the bones until golden brown, around 45 minute to an hour. Turn the bones mid way through to brown both sides. Make a sachet with the bay leaf, thyme and peppercorn and add it to the pot. Roast it at 350F for 30 minutes or until tender. Place the carrots in a blender and add a bit of the reserve stock to get it going. Soak the marrow bones in water overnight to remove the blood and impurities. Change the water several times during this process. Remove the marrow from the bones, be careful as the bones are hot.